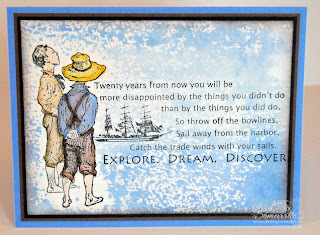 I just love the Artistic Outpost Huck Finn plate, it's great for masculine cards. Here, I stamped Huck and Tom in Black Archival, and colored them using the Marker Watercoloring Technique. I found proper placement for the sentiment using my Stamp-a-ma-jig, once dry, I masked my image, then did some Acrylic Block Stamping with a Blue Frost K-Pad to add over all color. Even though the blue did not come out too even in places, I love the look, looks like little ripples in the water. Just love how this turned out, the blue water and sky is just perfect for this adorable set. Love what you did here! The blue gives such an airy and magical feeling! Fabulous card, Lisa! Gorgeous background! 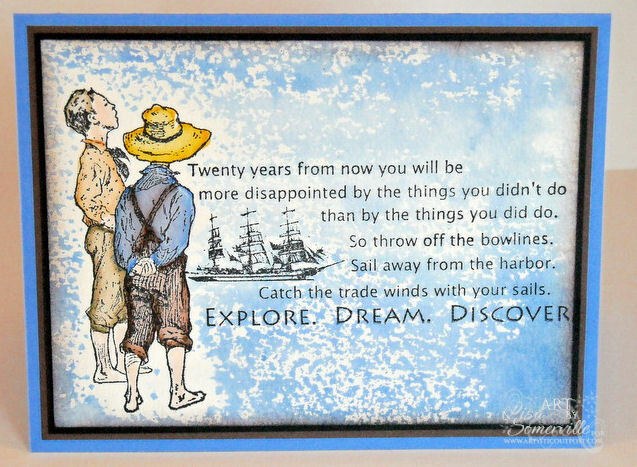 Love your huck finn scene! Beautiful card.